International Day of Action Success! After months of planning, the International Day of Climate Action finally came with great success. More than 5200 events in 181 countries around the world were registered on 350.org, demonstrating immense worldwide support for reducing the level of carbon dioxide in the atmosphere to 350 parts per million (ppm). Many people are calling this event the largest worldwide grassroots mobilization ever. With the support of the UUA, the UU Ministry for Earth, the UU Service Committee, the UU State Advocacy Networks, the UU-United Nations Organization, we were able to connect with congregations across the US and Canada. Over the course of the past couple of weeks, emails have been pouring in with details of the more than 110 UU-related events. This is so energizing to hear, knowing that the future of our world depends on our ability to effectively curb climate change, and the future of our brothers and sisters all over the world depends on our ability to do this justly. 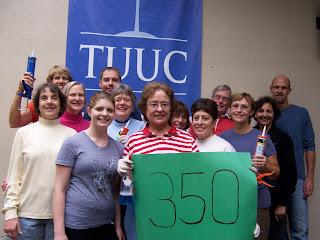 The UU Fellowship in Columbia, South Carolina is just starting up their Green Committee. Their 350 event was their first event ever and included collecting 350 Compact Flourcent Lightbulbs (CFLs) and donating them to Habitat For Humanity as well as starting up a new Freecycle Program. Members of Towson UU Church in Maryland spent four hours caulking and weather-stripping their church, reducing their need for dependence on fossil fuels for heating. Neighborhood Church in Pasadena, California brought their message to all those driving on the highway. 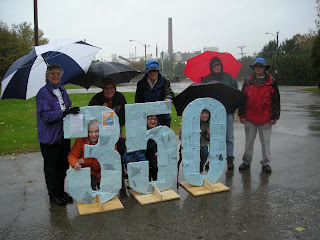 Members of the UU Congregation of Binghamton, New York held a vigil outside the gates of their local coal-fired power plant. Members of Edmonds Unitarian Universalist Church in Washington State watched the movie HOME, followed by discussions, sharing of resources, and petition-signing. Congregations all over the country catalyzed and supported interfaith and community-wide events. This is not only a UU issue, but something that reminds us of the interdependent web of which we are all a part. Dozens of congregations rang their bells 350 times, facilitated conversations in their congregations and communities, wrote letters to governmental officials, watched movies, sang out, and rallied! For some, these events were a great starting point for discussion, demonstration, and action. And for others, this is just a step on a path they’ve already been traveling. The press coverage of UU events was great, sharing news of these important events with folks not in attendance. Right now, we should celebrate these great efforts, but let’s keep our motivation for these events in sight–a strong and just international agreement on climate change policies.